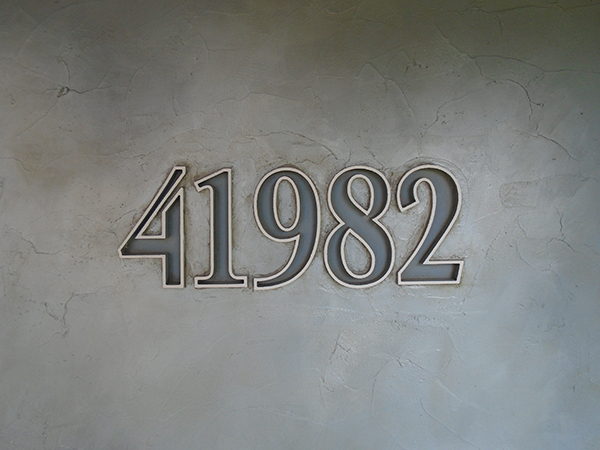 As we were renovating Peter and Hailey’s house they decided they wanted a little different approach to the house number on the outside. The house was built in the 60’s and at the start was very plain and basic. 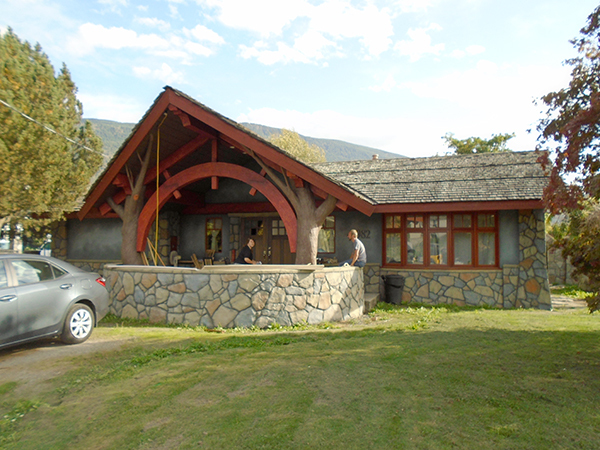 With the addition of the fancy porch, wide overhangs, large timbers and custom hand sculpted rock work it is really becoming a showpiece these days. The number is small in this picture and is partially hidden by Peter. They hand sculpted the rock work along the bottom third of the wall. Above that was a wide band of acrylic stucco which was troweled over a layer of 1″ thick styrofoam. 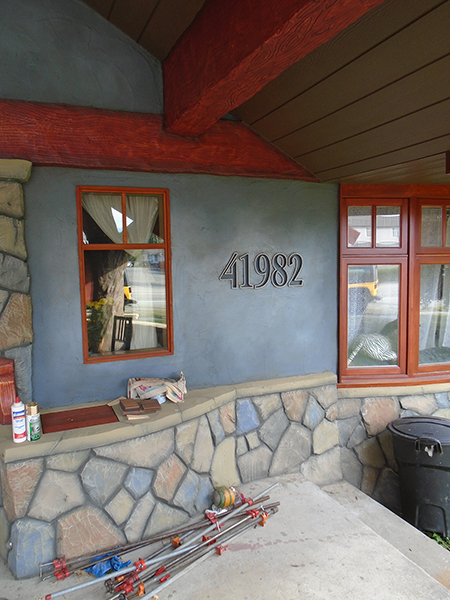 The stucco is about 1/8″ thick in total. Rather than simply cut out the numbers and glue them onto an uneven surface we decided it was better to cut them into a piece of 1.5″ thick Precision Board leaving a 1″ thick background to match the thickness of the styrofoam. We then fastened this to the wall with the recessed surface at the same height as the styrofoam base for the plaster. The acrylic plaster is done in two coats. The first has a layer of fiber glass mesh imbedded into it. This bridges any seams and gaps in the foam, including the join around our number board. Then a thin final smooth coat of acrylic plaster is troweled on. This was then painted as were the letters. The result was a durable set of numbers as it was routed from 30 lb Precision Board. They look very professional and very much a part of the custom design for the home.